The 19th century was a time of rapid improvement in agriculture in both Great Britain and the United States. Farming systems changed, and food production grew along with the expanding populations. Shorthorns were one of the earliest breeds to be improved and the first to be popularized, so North America drew from Great Britain their breeding stock as well as their breeding methods. Throughout the century there were times of agricultural prosperity as well as depression and people’s reaction to them reflected these fluctuations. There were also times of fads and pedigree worship which had to be overcome by common sense and practicality. It was during this century that Shorthorns became the most widely distributed cattle breed in the world, and they took part in the expansion of the use of both meat and dairy products in everyday diets. 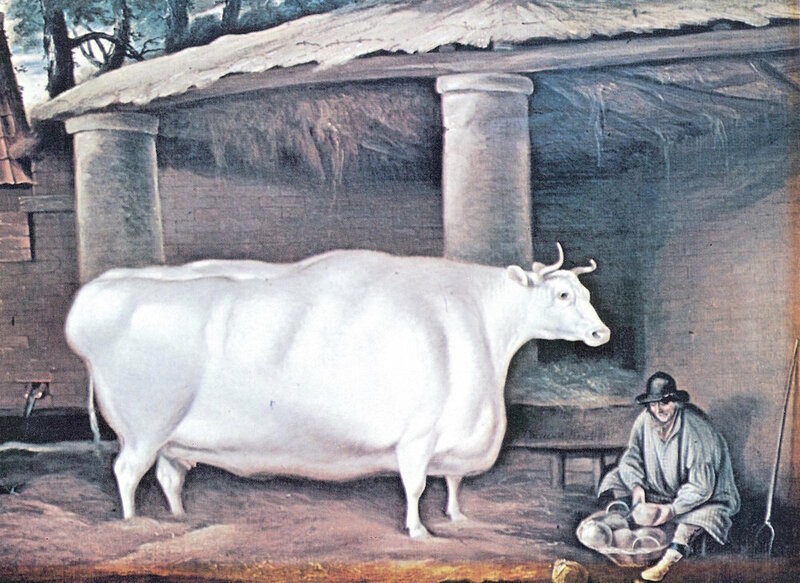 Note: Drawings of cattle in the 1800s were often stylized to suggest smaller legs and greater depth of body than was true for the actual animal. The color highlighting in the following pedigrees shows examples of how “In and In Breeding” was used in the creation of Shorthorns. 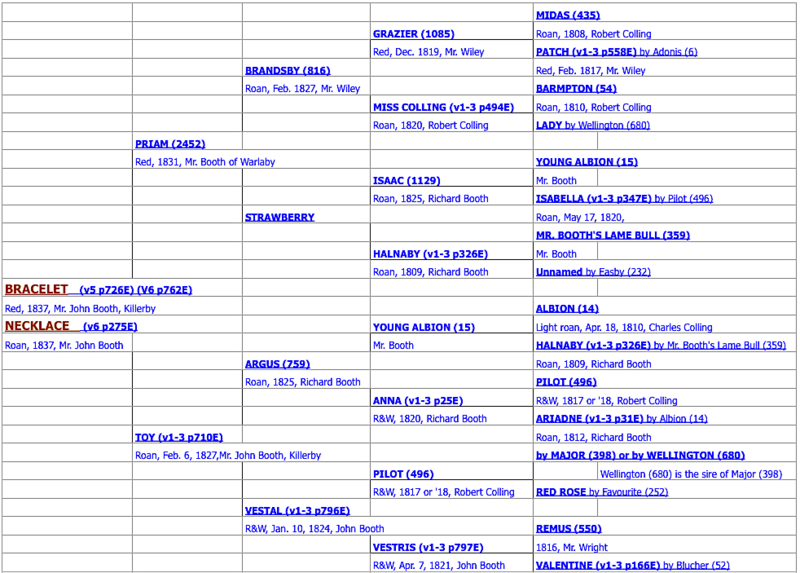 (See comments about "In and In Breeding" in the Early History paragraphs of the Breed History Page. This steer sired by Favourite (252) was fed to a weight of 3024 pounds at five years which was referred to as his “greatest flesh-taking capacity when his whole carcase was covered with thick fat.” He was then prepared for public exhibition. For six years he travelled throughout the principal parts of England and Scotland in a carriage while a fee was charged to view him because “he was such a wonderful animal far exceeding what had ever been seen before.” Offers as high as $10,000 were refused for him which was strong proof of his excellence as well as his exhibition value. At the time Shorthorns were a local breed and he did much to widen their recognition throughout Great Britain. Born twin to a bull and thus a free-martin sired by Favourite (252), she also was fed up to her “greatest flesh-taking capacity” and extensively exhibited. The reputation and wider knowledge of the Collings and their cattle were obtained from these public exhibitions. Her weight at the time of her eventual slaughter was reported to be no less than 2300 lbs. Considered to be the crowning achievement of Thomas Bates as a cattle breeder. Acknowledged as the champion bull of England in 1842. His weight at three years and eight months was 2520 pounds. A product of the Booth breeding program from which they achieved their best results by interbreeding their own established tribes or families. 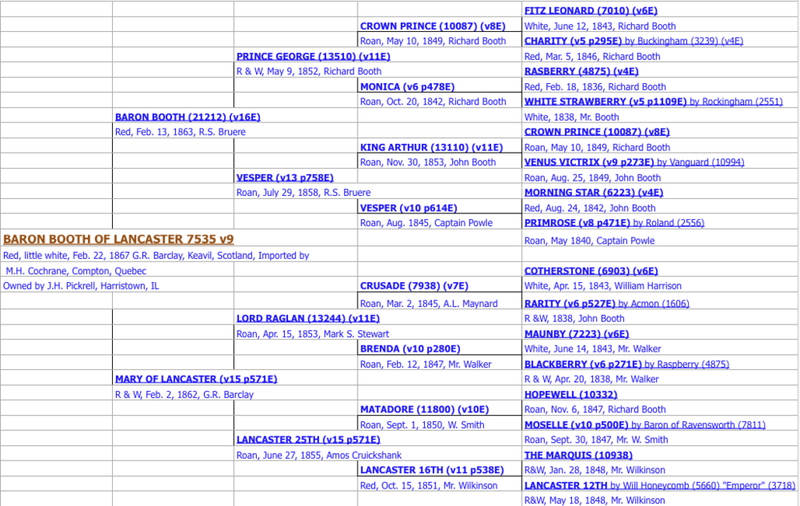 He was produced near the end of the breeding careers of the Booth family. Purchased for $1550 in 1869 by J. H. Pickrell. He was said to be “the greatest Short-horn of his day and generation on this continent.” His own show winnings and those of his get dominated at the fairs and elevated Illinois’ position as a state in the production of high class Shorthorns. His mature weight was reported to be 2600 pounds. J. H. Pickrell became the editor of the American Shorthorn Herd Book and first secretary of the American Shorthorn Association. A product of Amos Cruickshank’s program but used in William Duthie’s Collynie herd who secured many of the top females when Cruickshank sold out. “A massive 2500-pound bull, he sired some of the most celebrated show and breeding stock ever sent out from the North of Scotland.” He was leased for three years to Queen Victoria’s Windsor herd which increased the interest in Scotch Shorthorns in England. Celebrated English show cow bred and exhibited by Robert Thompson, Inglewood, Penrith. 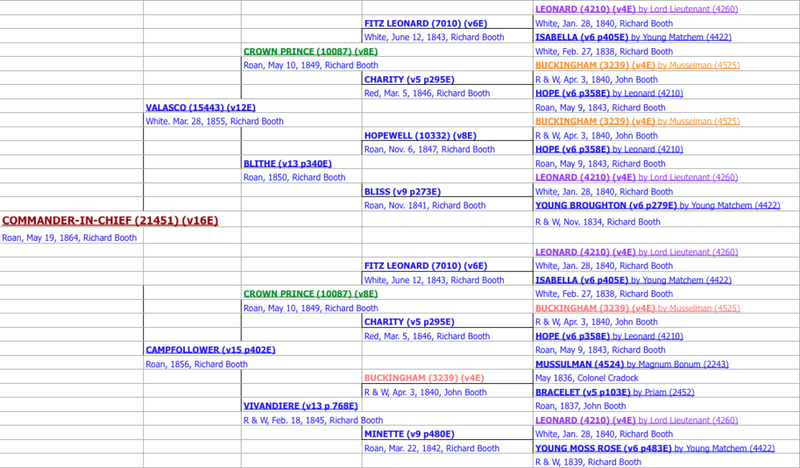 Note that she is a combination of Booth and Bates (Duchess) breeding. Her picture was chosen for the Heritage Shorthorn Society logo because she typifies the dual dairy/beef qualities of Shorthorns in the late 1800’s and early 1900’s. The 2 "Historic Duchesses” (below) sold for $40,600 & $35,000 in 1873, which is roughly comparable to $3/4 million each in today's dollars. 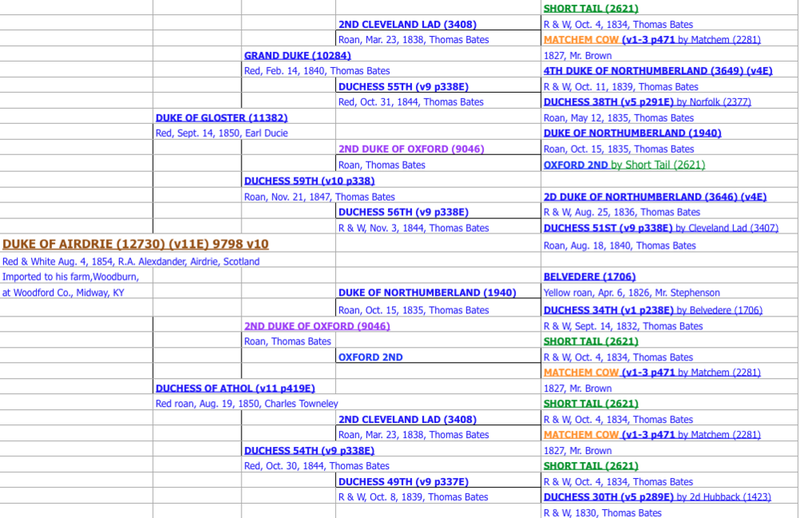 The Duchess line was originally by Thomas Bates, and over time it became a very long maternal lineage. Extraordinary prices were paid for "Bates Duchess bred" cattle during the time of the "Duchess craze" which occurred on both sides of the Atlantic in the late 1800s--see the comments about Duke of Connaught (33604), above. Since this lineage was ultimately in short supply in Great Britain some very high prices were paid to take cattle with Duchess pedigrees back to the "motherland". There is a fascinating discussion about them and "The Sensation of '73" in Alvin H. Sanders book "Shorthorn Cattle". White, Oct. 7, 1864, James O. Red & white, July 28, 1866, bred by James O.